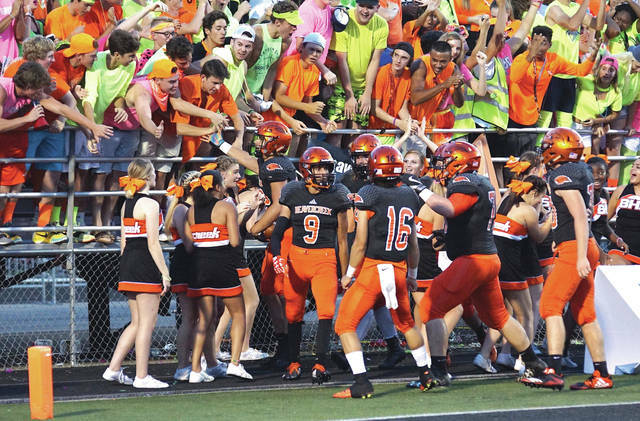 Junior wing back Sebastian Rendon celebrates with some Beavercreek students after his 57-yard touchdown run in the first half of Friday’s Sept. 22 high school football game with Kettering Fairmont. Beavercreek won 14-3 to remain unbeaten at 5-0 this season. Beavercreek running back Kaden Wenger dives for extra yardage during the first half of Friday’s Greater Western Ohio Conference high school football game against visiting Kettering Fairmont. Wenger gained 170 yards on the ground in the 14-3 Beavercreek win. Fairmont junior wide receiver Ryan Hall makes a one-handed catch against Beavercreek’s Drew Nanda, in Friday’s 14-3 loss to host Beavercreek. Hall led all receivers with three grabs for 67 yards. BEAVERCREEK— In an old-fashioned style football game that would’ve made Woody Hayes proud, host Beavercreek claimed a 14-3 win over previously unbeaten Kettering Fairmont, Friday night Sept. 23 at Frank Zink Field. Both teams relied on their bruising running backs to chew up yardage, but just one of them succeeded. Beavercreek’s Kaden Wenger entered Friday’s game as the Greater Western Ohio Conference’s second leading rusher with 804 yards rushing. He chugged for 176 more yards on 29 carries to up his season yardage total to 981. Meanwhile, Kettering Fairmont’s Jesse Deglow entered the game as the GWOC’s fifth-best rusher. Deglow could manage just 13 yards on the ground on nine carries. It was his lowest offensive output of the season. 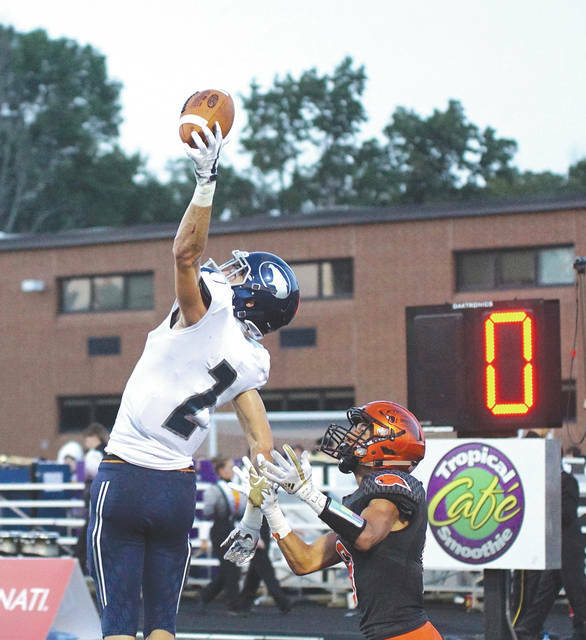 After a chess match of a first quarter, where both teams’ offenses seemed to mirror the other with off-tackle running plays into the line, Fairmont got on the Frank Zink Field scoreboard first. Two runs by quarterback Braden Miller of 29 and 30 yards were key in the seven play, 74-yard drive capped by a 31-yard field goal from Asher Rohm. The two teams traded 3-and-out drives, then Beavercreek responded with a 57-yard Sebastian Rendon pitchout to the right for a touchdown. Marcella Cash hit the extra point and the Beavers were out in front, 7-3, with just over three minutes left in the half. Cash then surprised Fairmont with an onside kick, which was snagged by Beavercreek senior Robbie Holstein at midfield on the ensuing kickoff. The Beavers took advantage of the possession, rolling 50 yards on seven plays. Quarterback Cody Hocker ran left from nine yards out and scored. After another Cash kick, Beavercreek was out in front, 14-3. Beavercreek’s Maurice Wilson intercepted a Brendan Miller pass on Fairmont’s next possession, but Cash’s 33-yard field-goal try fell just under the crossbar as time expired in the half. Neither team could muster any points in the second half. Fairmont stopped Beavercreek’s first drive of the second half on the Firebirds’ 4-yard line, as Hocker tried a quarterback sneak on fourth down and 3, but fell a yard short. The two teams traded possessions and went three plays and punted. Then it was Fairmont’s turn to mount a drive. 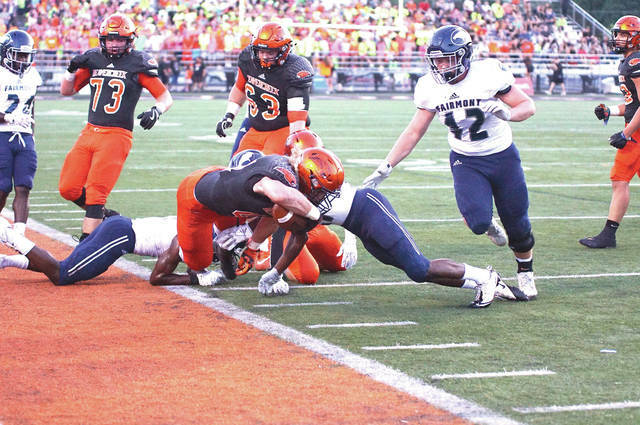 The Firebirds got the ball down to the Beavercreek 23-yard line, but the Beavers defense stopped Deglow a yard shy of a first down to turn the ball over to Beavercreek on 4th-and-2. On the Beavers’ next possession, ‘Creek used Wenger on 10 of 15 plays to get to the Fairmont 5-yard line, but Wenger fumbled the ball into the end zone and the Firebirds’ Garrett Baker recovered the ball to end the drive. Fairmont had one last try at getting the ball into the end zone. The Firebirds mounted a 10-play drive, but again Deglow was stopped on fourth down to end the drive, this time on Beavercreek’s 11-yard line. Beavercreek then ran out the clock with two 1-yard Hocker runs. This marks the first time Beavercreek has gone undefeated after five games in a season since 2008. The Beavers will play a 7 p.m. game Friday, Sept. 29 at Springboro next week. Fairmont hosts Miamisburg that same night.